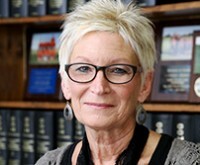 Kathy Bray has been the office administrator for Brammer & Yeend Professional Corporation since May of 1993. She is responsible for the scheduling of tax appointments, billing and numerous other jobs. Kathy is married to Mike and has two grown daughters, Adria and Emily, and six grandsons. She has lived in Shelbyville, Indiana all her life and graduated from Shelbyville High School and Indiana Business College. She enjoys attending her grandsons’ sports, Colts football, shopping, eating out and spending time with family and friends.